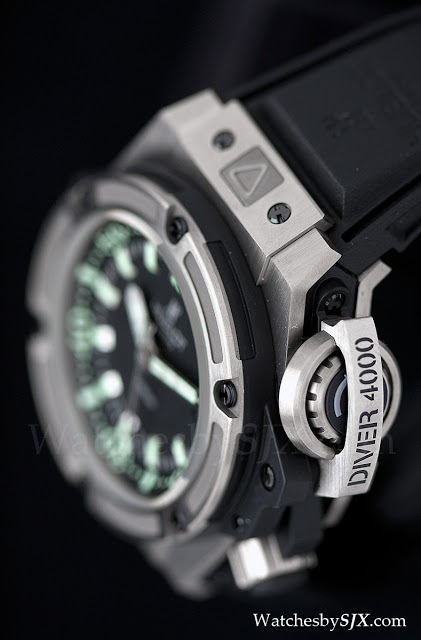 Hublot, and by extension Jean-Claude Biver, excels at over the top watches. 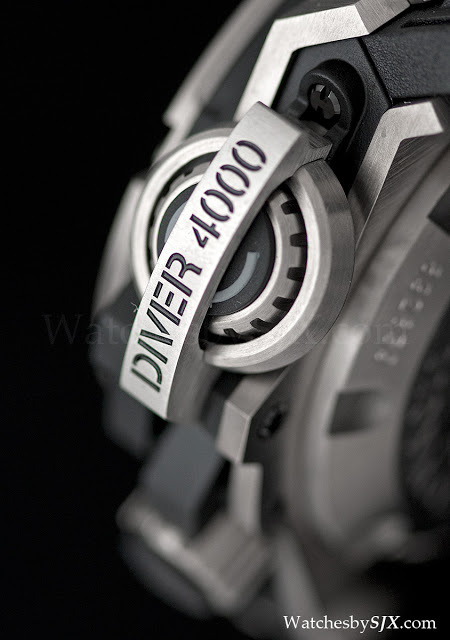 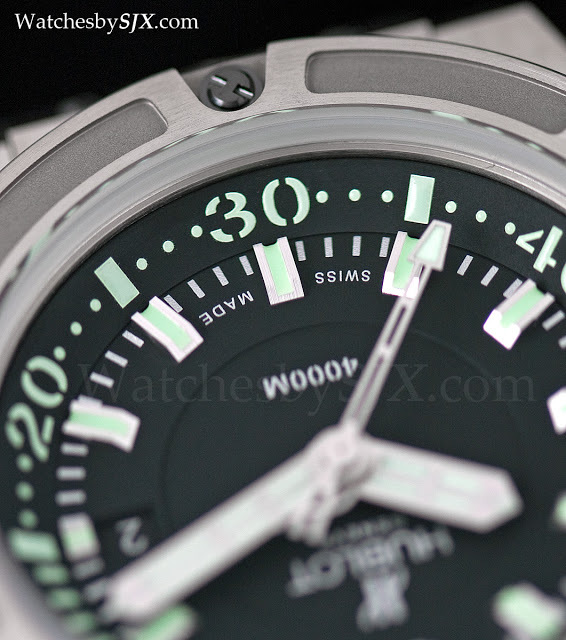 The Oceanographic 4000 exemplifies that. 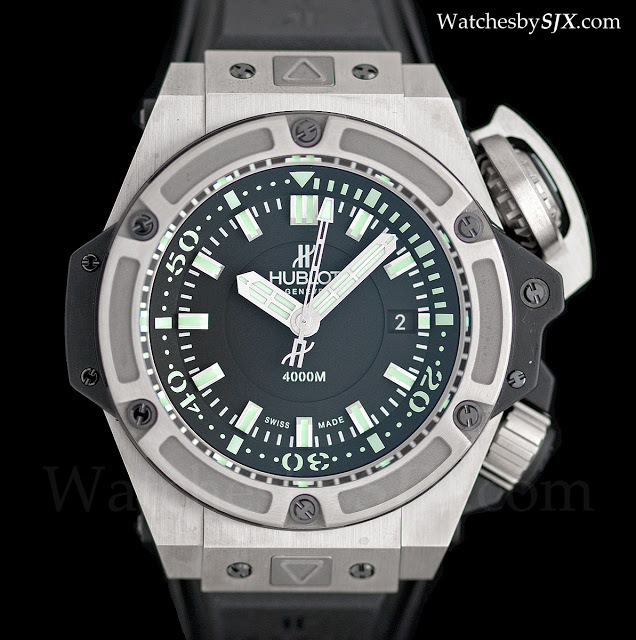 Its sheer bigness is overwhelming. 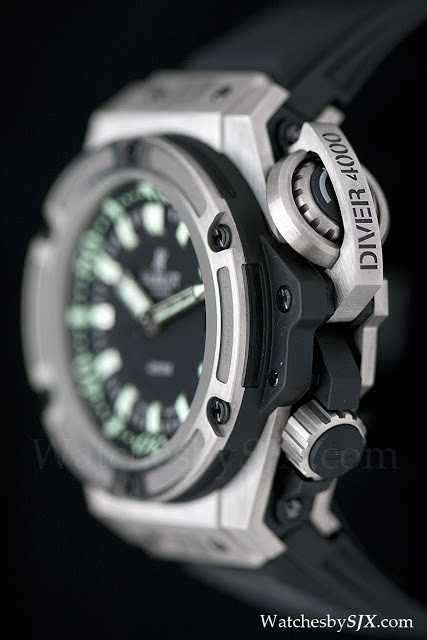 At 48 mm it is large but that is exaggerated by its design. 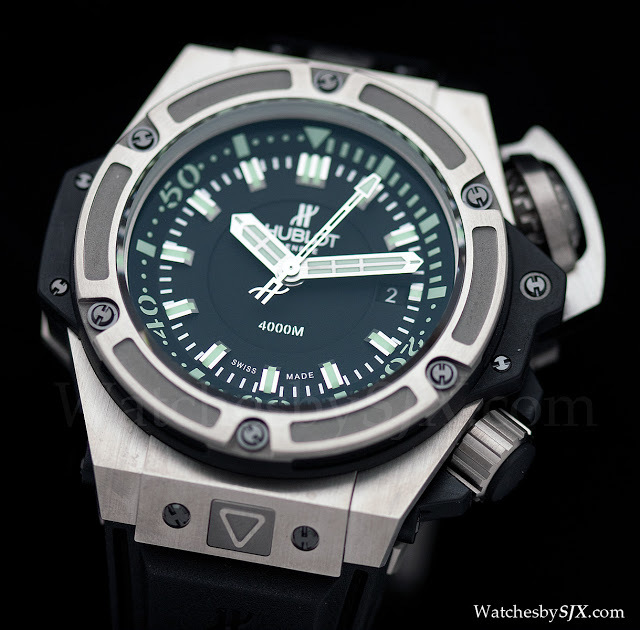 Two oversized crowns dominate the case. 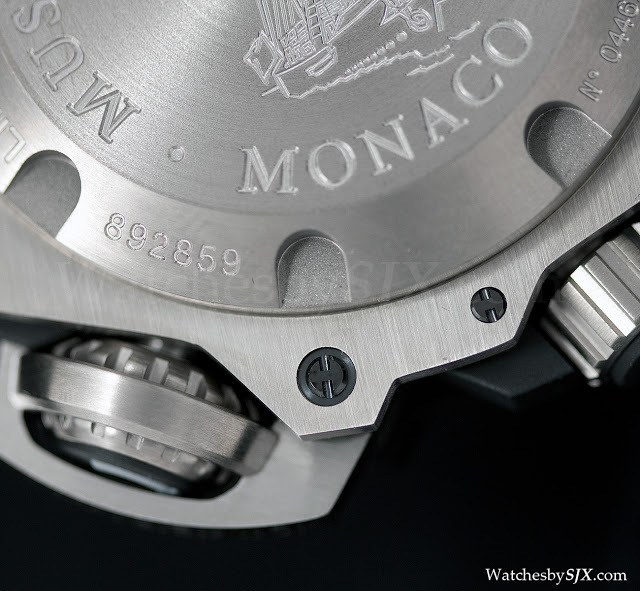 The one at two o’clock, secured by a cap, is for the rotating inner bezel, while the other crown is for the time and winding. 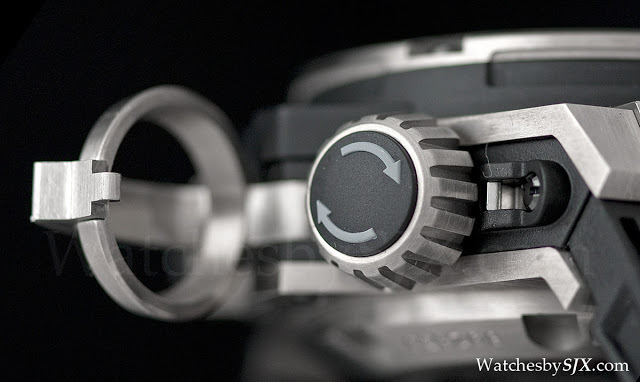 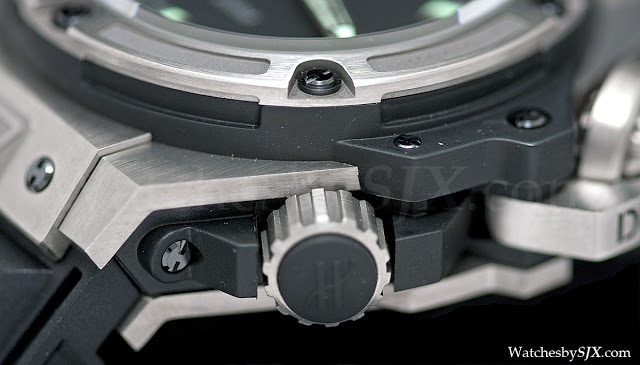 The cap for the inner bezel crown is beautifully machined, as is the rest of the case. 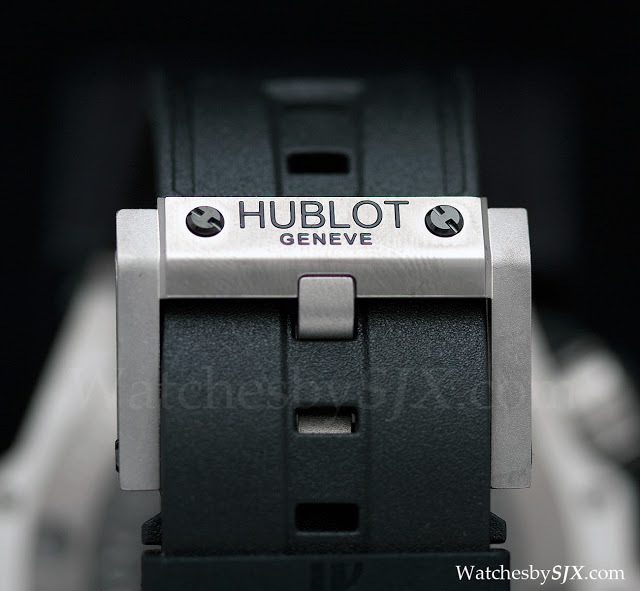 Due to the use of multiple materials and the sandwich construction, Hublot cases are best viewed from an angle, just like with the Big Bang King Power. 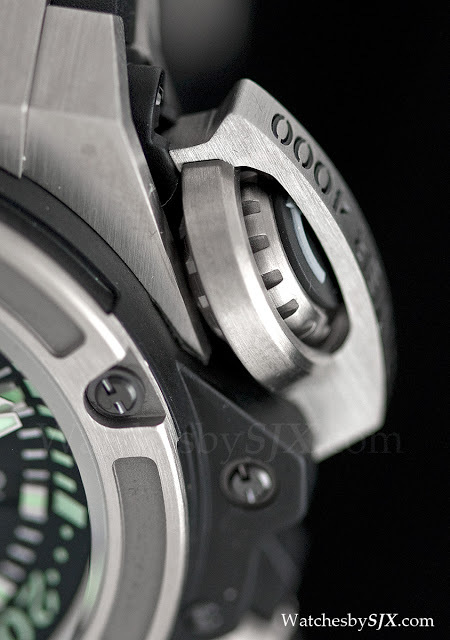 That is when the details become apparent. 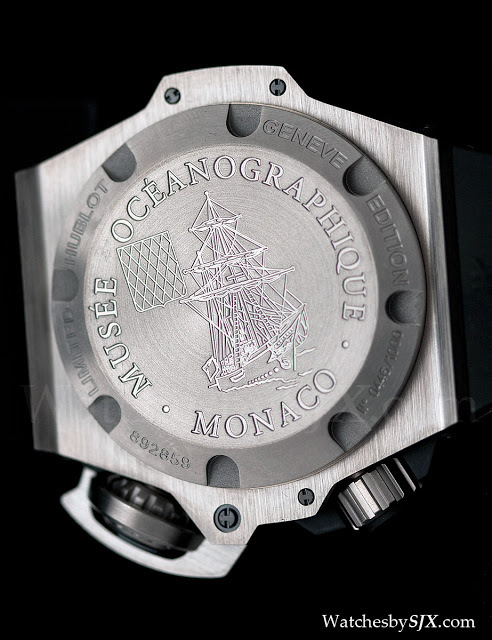 But in the Oceanographic not only are there details, but there is also the 6.5 mm thick sapphire crystal – that’s thicker than most ultra-slim mechanical watches. 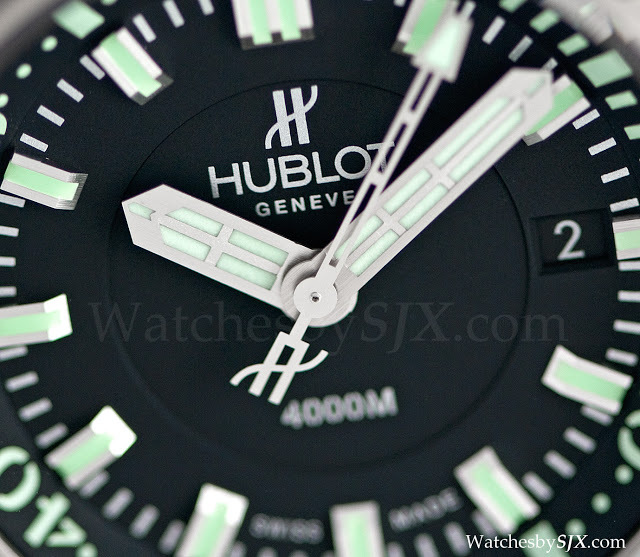 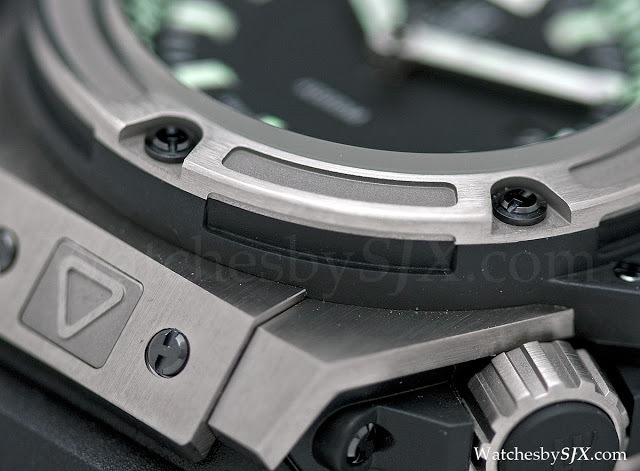 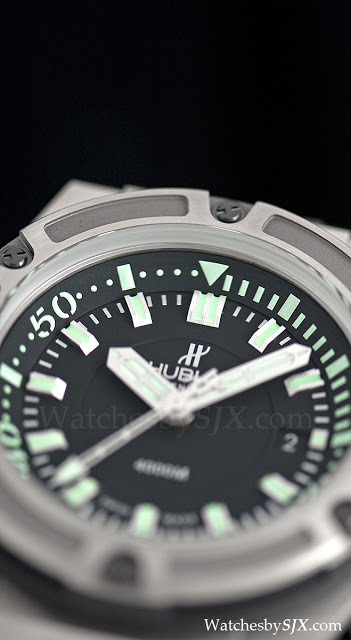 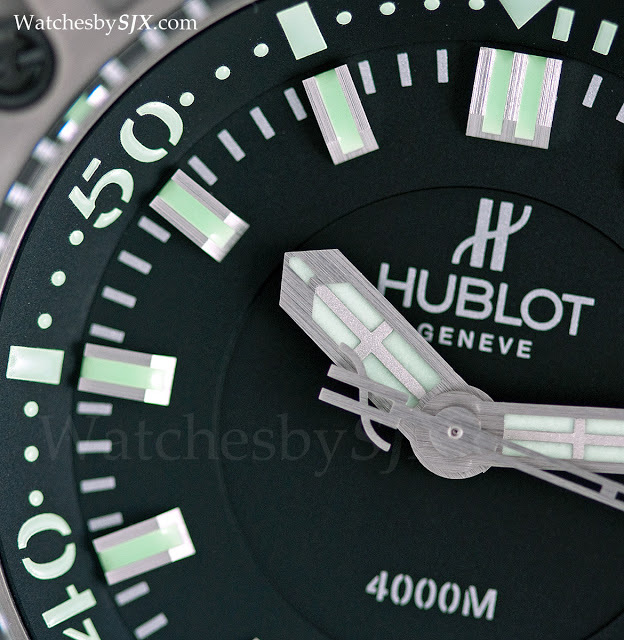 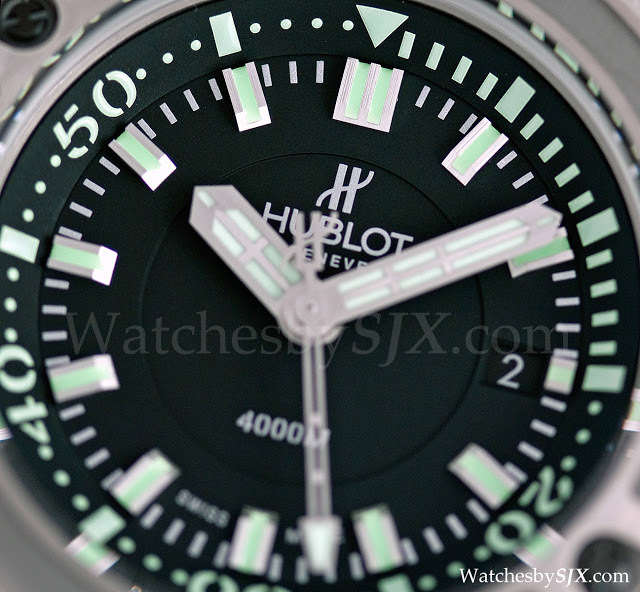 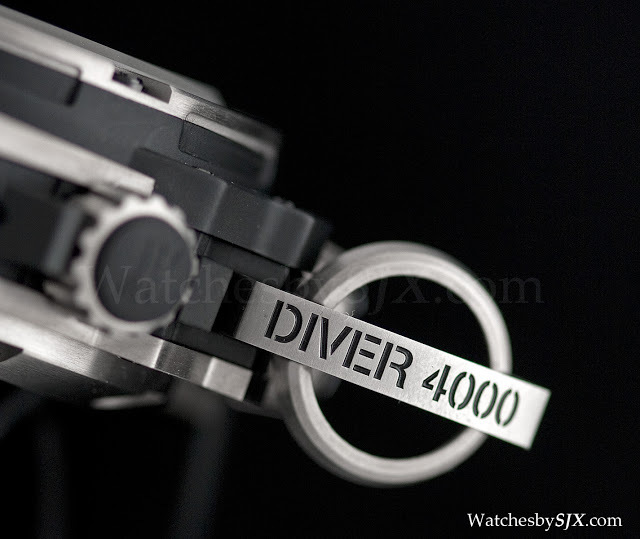 The name of the watch refers to the 4000 m it’s rated to, though Hublot helpfully tests the watch to 5000 m. And the arrow on the case near the strap is a button that allows quick release of the strap, so the owner can swap between the two straps (one an extra-long nylon for the diving suit) Hublot provides.